A new motor-car speed record between Auckland and Wellington was established yesterday by Mr George L Campbell and Mr Leslie F Bedford. 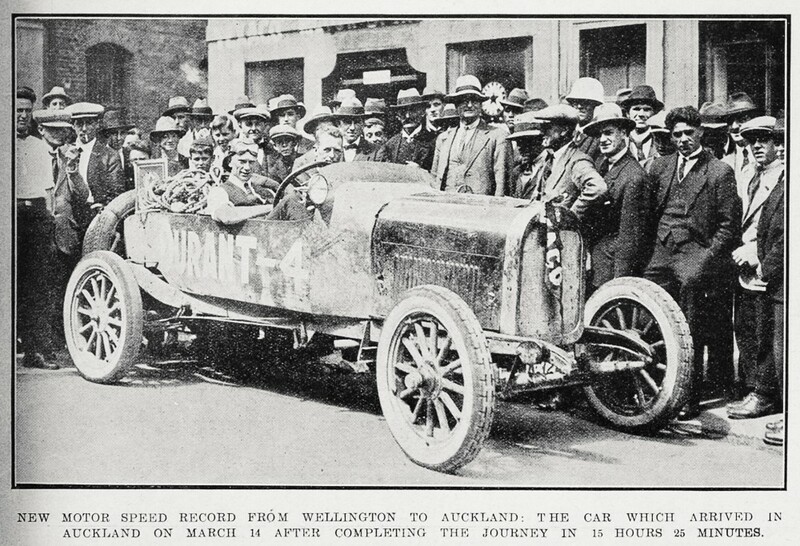 The car, a Durant Four, left Wellington at 3 am, and drew up outside the general post office at Auckland at 6.25 pm, after a trip of 15 hours 25 minutes, which is 42 minutes better than the time taken by the previous holder of the record, Mr W S Miller, who did the journey in a Chandler car. Progress telegrams had been received in Auckland during the day and the car was expected shortly after six o'clock, at which time a large crowd of people, including the Mayor, Mr J H Gunson, and officials of the Auckland Automobile Association had gathered in the vicinity of the post office. As soon as the car stopped, it was rushed by a cheering crowd, and the record-breakers were accorded a flattering reception. When Mr Gunson could get near the car he congratulated Messrs Campbell and Bedford on their fine performance, and welcomed them on behalf of Auckland. Messages brought from Wellington were delivered, and the car, with the Mayor at the wheel, was taken to the garage, while Mr Campbell was carried shoulder-high along the street. Mr Campbell said that before the trip was commenced all particulars regarding the car and the names and addresses of Mr Bedford and himself were taken by the police. On Saturday he saw Inspector Mcllveney, of Wellington, who warned him of the risks he was taking regarding breaches of speed-limit laws. Mr Campbell replied that it was his intention to observe all by-laws when passing through towns, and that was done. The start was made at 3 am, cars accompanying the Durant, which is owned by the Campbell Motors Ltd, as far as Petone. As the Aucklanders did not know the road to Wanganui very well, Mr Ben Campbell, of Wellington, drove that far. A storm was raging on Paekakariki Hill, but the motorists kept on and reached Hawera shortly after eight o'clock. Rain fell 'till Mount Messenger was reached, while birds proved dangerous, as the car had no windscreen. Unfortunately, a wheel struck a stone, which flew up and pierced the petrol tank, making it extremely difficult to keep up the pressure of benzine. The river at Mokau was safely crossed by punt at 11.30 am, and here the hole in the tank was soldered by Public Works Department employees. At Uruti the flooring of a wooden bridge was being taken up, and there were just enough planks left for the car to cross. Had the car arrived a little later at the bridge, a delay of several hours would have been inevitable. The roads were good for the first 300 miles, but the Taumatamaire Hill, the worst road experienced on the trip, was passed over in pouring rain. "We expected that we would have to give it up here," said Mr Campbell, "the road was in such a dreadful state. At Piopio, Te Kuiti, cars met and escorted us to the town, where we arrived at 2.50 pm. It was still pouring with rain, but cleared when we were half-way between Te Kuiti and Hamilton, which we reached at 3.45 p.m. At Ngaruawahia we were offered ropes to help us over the Rangiriris, but we did not use them as the surface was only slippery. We had no punctures and never used chains." A feature of the trip, said Mr Campbell, was the amazing interest taken by people all along the route. At every township, people simply crowded the street and gave the motorists a great reception. The whole township turned out at Te Kuiti, and the police had to keep back thousands of people at Hamilton. Policemen were posted at every town passed through, but no one stopped the car. Local residents were ready with refreshments wherever a halt was made, and there was no difficulty in obtaining benzine and oil for the engine. The total distance covered was 481 miles. Cars from Auckland met the Durant at Manurewa. The motorists brought a military despatch for the headquarters of the Northern Command and messages for the Mayor and the harbourmaster, Captain H H Sergeant.